This upcoming weekend is the unofficial start of summer here in Canada. My Canadian friends and I call this long weekend “May two-four." For one thing, Monday is Victoria Day (this year on May 22nd), and the birthday of Queen Victoria fell on May 24th. For another thing, the long weekend launches cottage/camping/party season and many "two-fours" (24-packs) of beer will be consumed over the next three months (starting this holiday Monday no doubt). 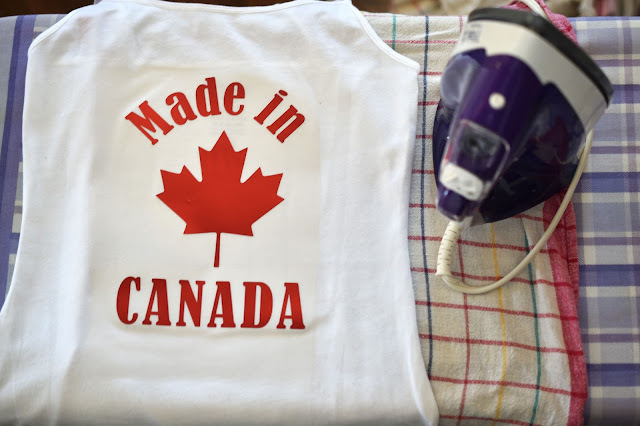 I thought it would be fun to mark this distinctly Canadian holiday by making a couple of Cricut iron-on projects that celebrate our much-beloved country. 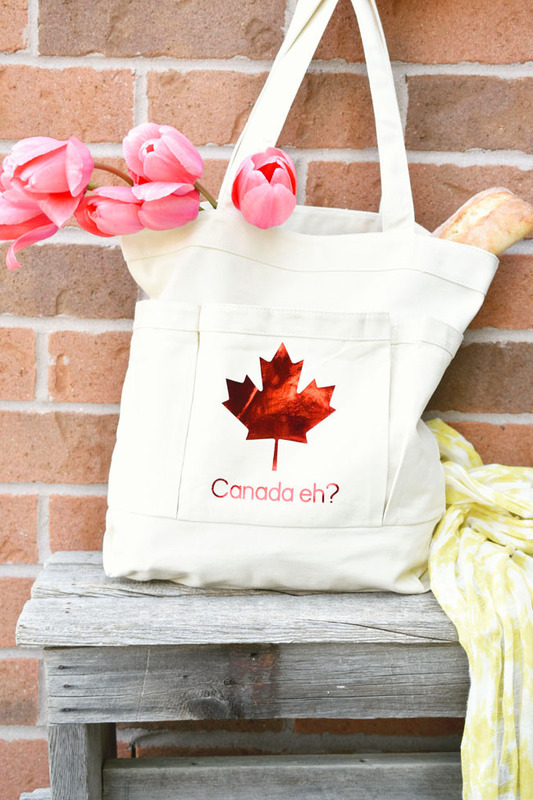 I thought it would be fun to get into the spirit of Victoria Day by making a Canada-inspired tote project with my Cricut Explore Air. 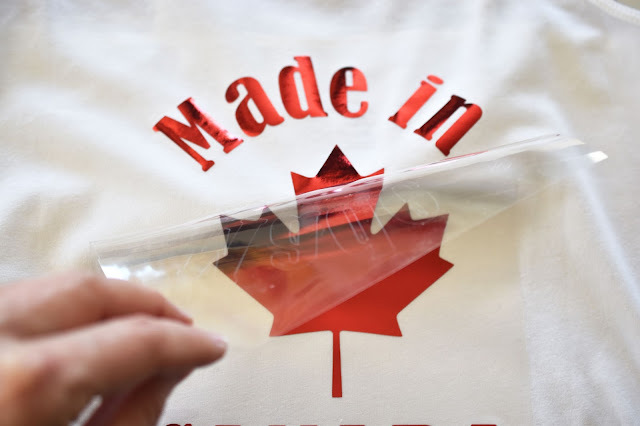 As the Canadian flag is red and white with a red maple leaf in the centre, I decided to create a maple leaf and text in red foil iron-on film. 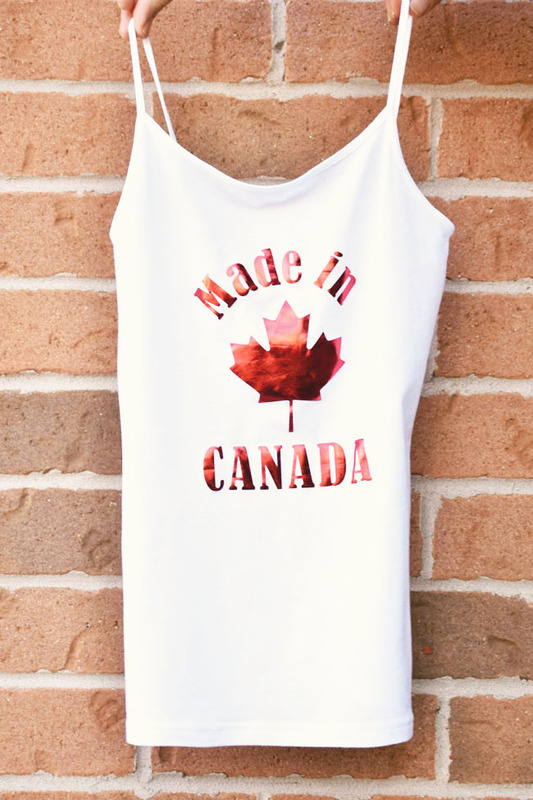 I also used some of the same pretty red foil iron-on material to create "Made in Canada" wording around a Canadian flag on a tank top for my daughter. What materials can I cut with my Cricut? 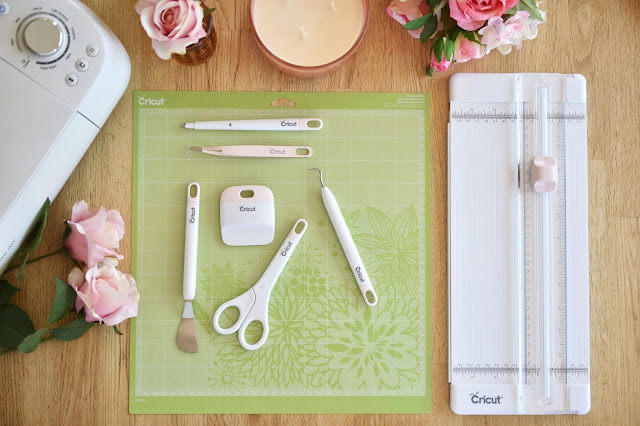 If you have a new Cricut cutting machine, you might wonder what different materials you can cut. I'm still learning myself, but I have experimented quite a bit now with cardstock, vinyl (still loving the adhesive foil in gold!) and now iron-on. 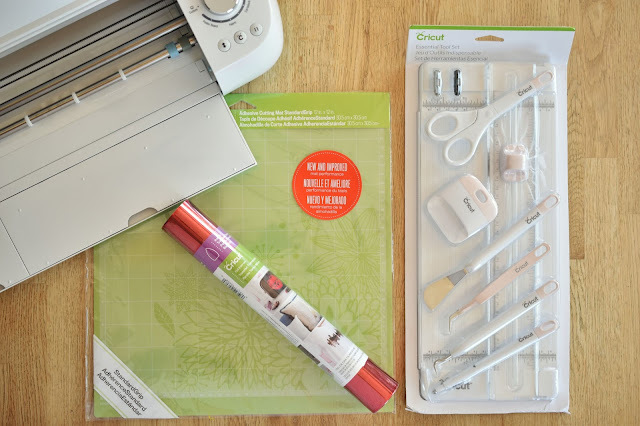 Here is a partial list of materials you can cut with your Cricut. Let your imagination run wild! Visit Cricut help for more material suggestions, plus the blade type and cutting mat required for each material. 1. Find a simple maple leaf image. 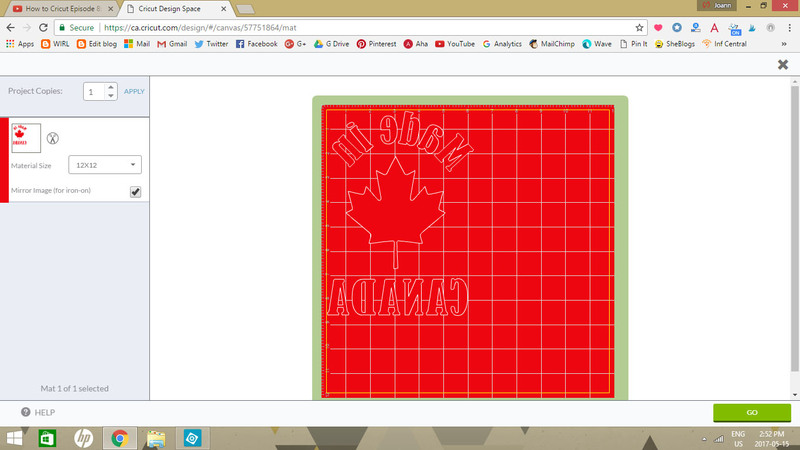 Search the over 60,000 images in Cricut Design Space™ or upload a maple leaf image from the Internet. 2. Create a new project in Design Space. Insert the maple leaf. Compose the text you desire in one of your system fonts or a Cricut Access font. If you wish to curve the letters around the maple leaf, as I've done with the "Made in," first isolate the letters. 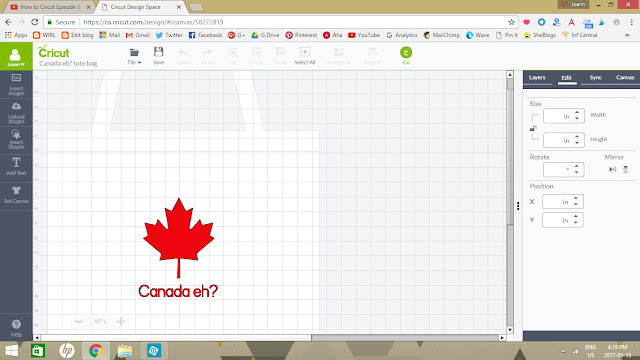 Create a temporary circle over the maple leaf as a guide. Turn each letter so together they angle around the top of the circle. Delete the circle. What's neat is you can set your canvas to look like the item you'll be ironing on. 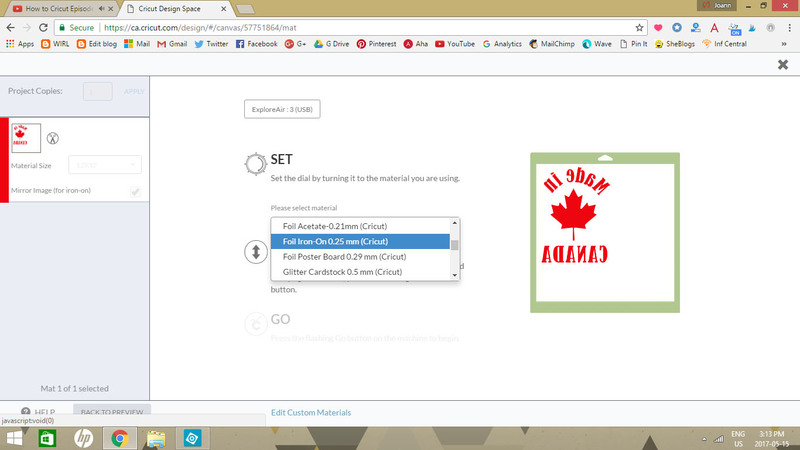 Choose "Set Canvas" on the left in Design Space. 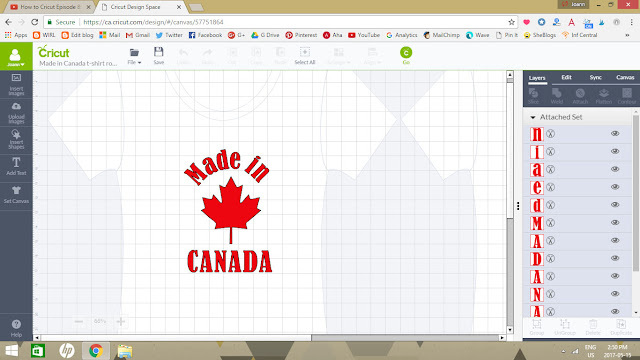 I chose a small women's tee for my daughter's project. 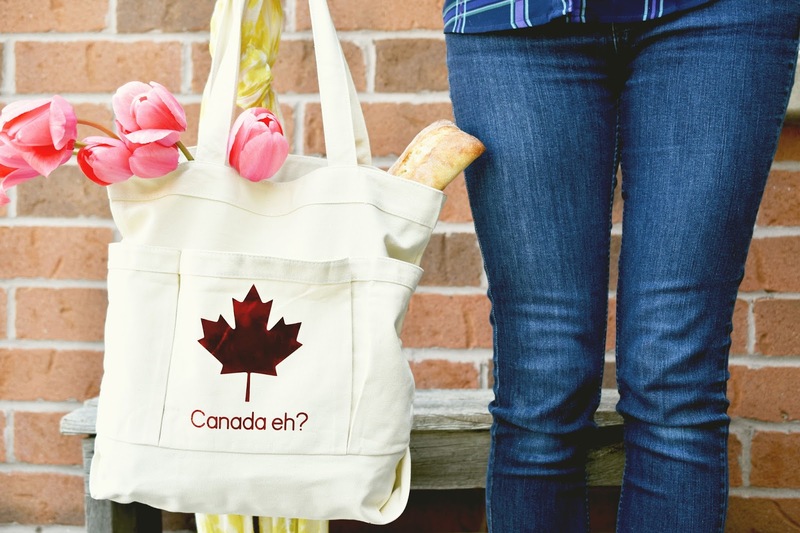 And I chose a tote bag for my tote bag project, naturally. It's a great way of helping you visual and size your project. Of course you'll want to check the measurements of your image and measure your tee or tote to ensure you cut the size you desire. 3. When you're ready to cut, hit "Go." This part is very important - check off Mirror Image (for iron-on)!!! And if you go back a step for any reason be sure to check the box again. I'm going to admit right now that I went back, forgot to check the box again and cut the image the wrong way. Wasteful of materials. 4. 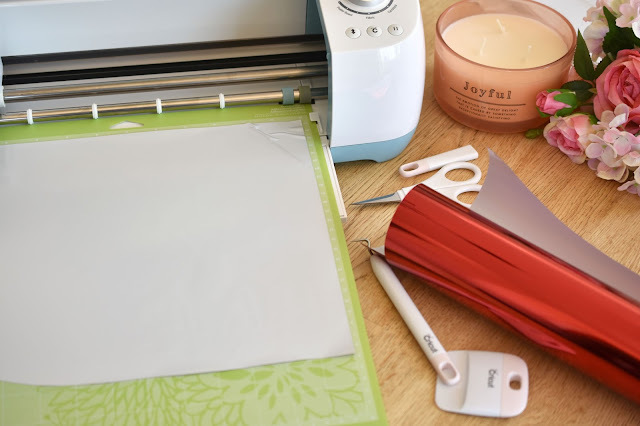 Cut the Cricut iron-on sheet to the desired size and place onto the StandardGrip cutting mat, liner side down. If you're new to iron-on, peel back a corner of the iron-on sheet to ensure you know which side is the liner. Listen, I have another oops to admit. I did it wrong the first time. I make mistakes so you don't have to. Nice of me huh? 6. 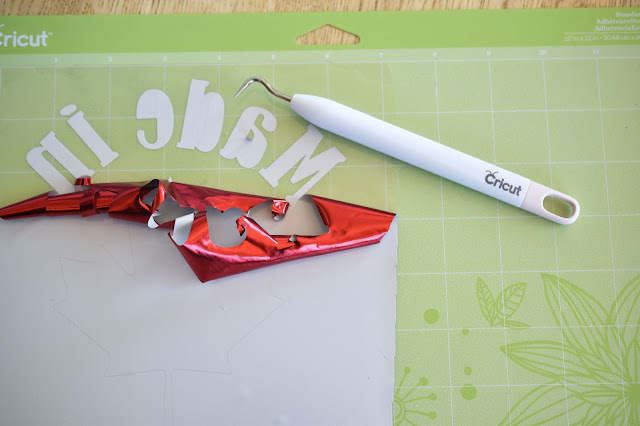 Remove negative Cricut iron-on material, leaving only the cut image on the liner. Use your weeder tool to help the process along. 7. Set your iron to the wool setting, with no steam. I bought a new iron to ensure this project would work. Our previous iron didn't seem to be as hot as it should be and I wasn't taking any chances! 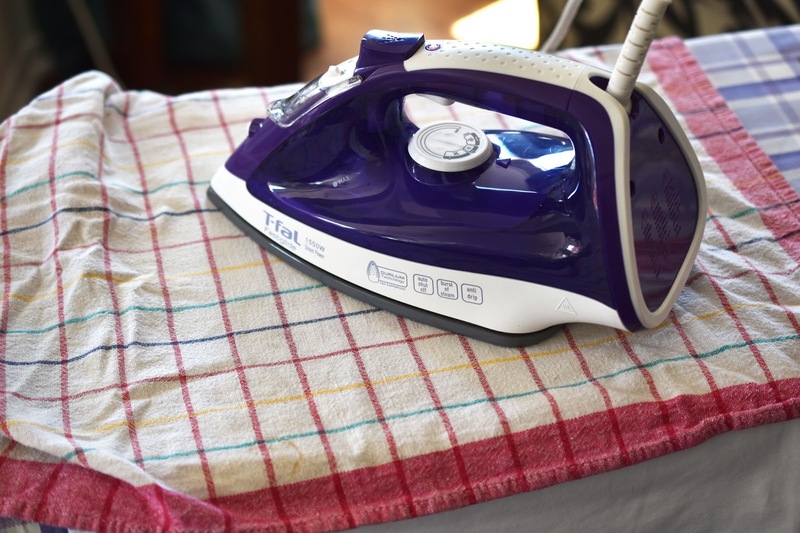 Use the iron to preheat the area of the material where you will be applying your image for 10 seconds. 8. Place the image, liner side up (so you can read it left to right), onto the preheated material. Place a clean cotton cloth over top. I'm not fancy - I found a dish towel. 9. Apply medium pressure with the iron for 30 seconds (or about 100 seconds if you're like me - but don't burn anything!). Flip the material and apply pressure for another 25 to 30 seconds (or so says the instruction sheet - I didn't do this). 10. Let cool a few minutes with the liner intact. 11. Remove liner when cool to the touch. Psst: the beautiful rose-coloured Cricut Essential Tool Set I'm using is on sale right now! It includes a handy trimmer and a scoring blade that's great for scoring cards and envelopes. 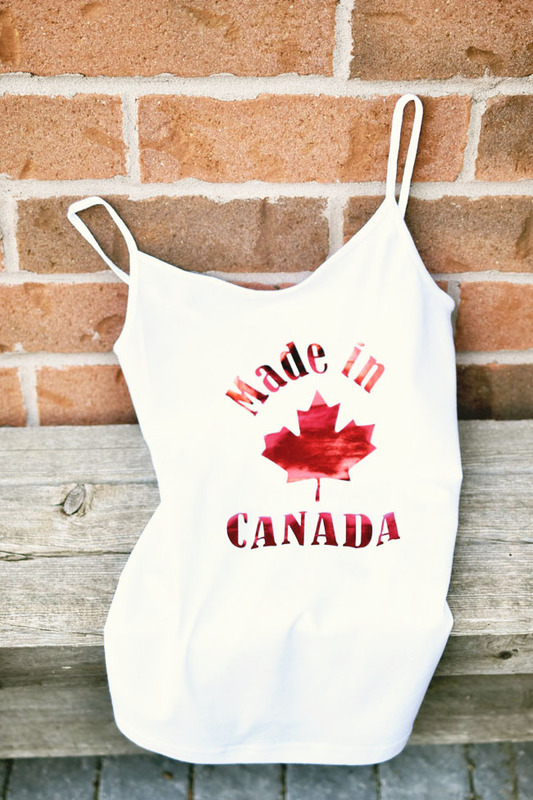 My daughter is 12 and no longer models for me, so here once again is her pretty red foil iron-on "Made in Canada" tank top, hanging out on its own for the moment. Maybe I'll catch her wearing it this weekend via Instagram Stories. Or possibly not. I found the notion of iron-on a bit intimidating at first. How many ways could I screw it up? But now that I've done it once (or twice) I feel totally comfortable with the process and I'll surely be doing it again. It's pretty simple actually. And you can also use Cricut iron-on film to iron fun sayings onto home decor items such as dish towels and pillow covers. I particularly like this beautiful "Joy" light gold pillow project, available in Design Space. 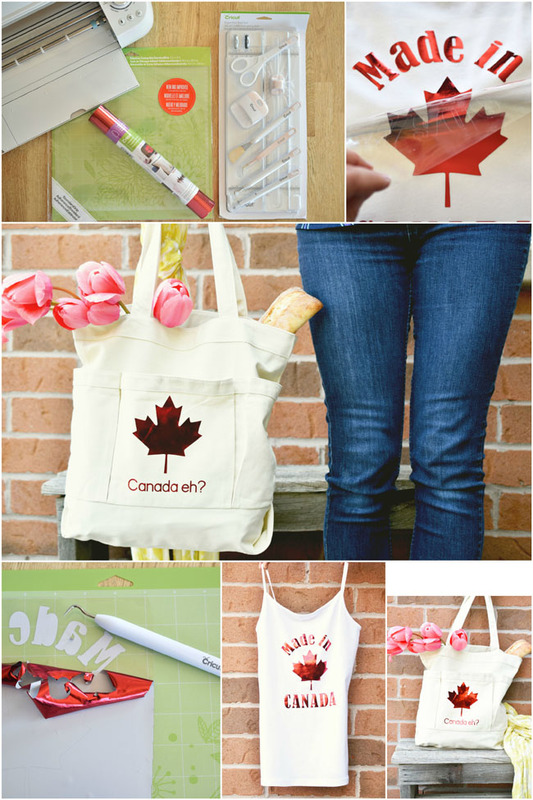 Have you tried a Cricut iron-on project? Any tips? You are so crafty! I love the lettering on the tank. So vibrant. Canada is the best place in the world and I hope to one day see more of it!! Thanks Leslie! It is, isn't it? That is so awesome!! I would love to do a vinyl decal for my swell waterbottle! I'd love to make a top like yours, looks easy to make, I just need to put my hands on it.